A perfect combination of performance quality you can trust with top choice brand, this custom polo will step up your game in any business, sport or casual branding needs. Smooth to the touch, moisture wicking and easy to care for materials will keep you on the go faster and longer. Made from 57% cotton, 38% polyester, 5% elastane, this custom polo features soft anti-pick, anti pill fabric for a clean, snag free finish. 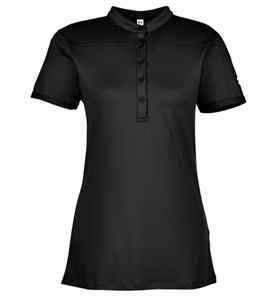 With moisture wicking technology, this custom polo is sure to keep you dry all thorughout the day. Four way stretch fabrication allows greater mobility in any direction and comfort. Featuring rolled forward shoulder seams and a contoured silhouette body for a flattering figure and super slim stand collar with five button placket. UA logo located on left bicep.